Trojan horse or Trojan is a malicious computer program that is often disguised as legitimate software. It is a program that appears harmless, but used to hack into a computer by misleading users of its true intent. Name Trojan horse, derived from the Ancient Greek story of the wooden horse. This terminology occurred for the first time in a US Air Force report in 1974 on the analysis of vulnerability in computer systems. It was made popular by Ken Thompson in his 1983 Turing Award acceptance lecture "Reflections on Trusting Trust". 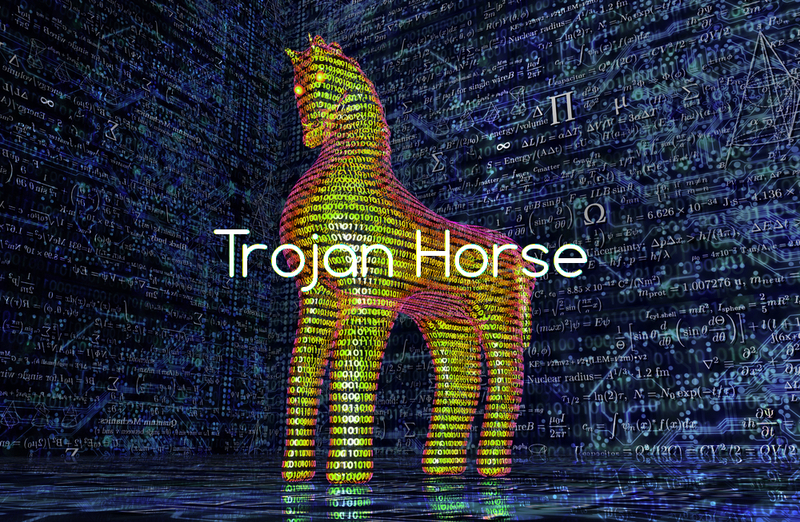 Attackers have long used Trojan horses as a way to trick end users into installing malware. Trojans can be employed by cyber-thieves and hackers trying to gain access to users' systems. Users are typically tricked by some form of social engineering into loading and executing Trojans on their systems. Typically, the malicious programming is hidden within an innocent-looking email attachment or free program, such as a game. When the user downloads the Trojan horse, the malware that is hidden inside is also downloaded. Once inside the computing device, the malicious code can execute whatever task the attacker designed it to carry out. This infection allows an attacker to access users' personal information such as banking information, passwords, or personal identity. Here’s a Trojan malware example to show how it works. You might think you’ve received an email from someone you know and click on what looks like a legitimate attachment. But you’ve been fooled. The email is from a cybercriminal, and the file you clicked on downloaded and opened has gone on to install malware on your device. When you execute the program, the malware can spread to other files and damage your computer. Trojans are designed to do different things. But you’ll probably wish they weren’t doing any of them on your device. Unlike computer viruses and worms, Trojans generally do not attempt to inject themselves into other files or self-replicate. Because the user is often unaware that he has installed a Trojan horse, the computing device's security depends upon its antimalware software recognizing the malicious code, isolating it and removing it. Rootkits are designed to conceal certain objects or activities in your system. Often their main purpose is to prevent malicious programs being detected. Trojan gives malicious users remote control over the infected computer. They enable the author to do anything they wish on the infected computer – including sending, receiving, launching, and deleting files, displaying data, and rebooting the computer. DoS attacks against a targeted web address by sending multiple requests from your computer and several other infected computers. Trojan-Spy programs can spy on how you’re using your computer. For example, by tracking the data you enter via your keyboard, taking screenshots, or getting a list of running applications. This can be hidden in games or other programs of a smaller variety and give the attacker control of the victim’s computer. This Trojan downloads malicious software and causes harm to the victim’s computer system. As a proxy server, this allows the attacker to hijack a victim’s computer and conduct illegal activities from the victim’s computer. This Trojan attempts to steal information from the victim’s computer. Trojan-FakeAV programs simulate the activity of antivirus software. They are designed to extort money from you – in return for the detection and removal of threats; even though the threats that they report are actually non-existent. Trojans may allow an attacker to access users' personal information such as banking information, passwords, or personal identity. It can infect other devices connected to the network. Ransomware attacks are often carried out using a Trojan. To avoid being infected by Trojan malware, users should keep their antivirus software up to date, never download files or programs from untrusted sources, and always scan new files with antivirus software before opening them. Here are some dos and don'ts to help protect against Trojan malware. Computer security begins with installing and running an internet security suite. Run periodic diagnostic scans with your software. You can set it up so the program runs scans automatically during regular intervals. Update your operating system’s software as soon as updates are made available from the software company. You should also check for updates on other software that you use on your computer. Protect your accounts with complex, unique passwords. Create a unique password for each account using a complex combination of letters, numbers, and symbols. Keep your personal information safe with firewalls. Backup your files regularly. If a Trojan infects your computer, this will help you to restore your data. Be careful with email attachments. To help stay safe, scan an email attachment first. Don’t visit unsafe websites. Some internet security software will alert you that you’re about to visit an unsafe site. Don’t open a link in an email unless you’re confident it comes from a legitimate source. Don’t click on pop-up windows that promise free programs that perform useful tasks. Don’t ever open a link in an email unless you know exactly what it is.